Well, knit as I might, I was not able to get my Greta vest finished to add to the 2013 report, but that’s okay – I got lots knit in a year and am very pleased with what I got done. I also got one more UFO off the needles yesterday — by ripping it back. My Ananke just wasn’t going to be what I wanted. It was going to be too deep from middle to point and not as long across the top as I wanted — I already have one that turned out like that and I never wear it and I loved the yarn I was using too much to waste it so off the needles it came. As for remaining UFOs — there are several pairs of socks that need mates — these are mostly too small for me because of cable designs in them etc and so I’m not in as much of a hurry (obviously since they’ve been sitting there for at least two years) to finish them if I can’t wear them. But eventually my sister will have warmer feet since they’ll go to her. And I’m guessing there’s probably 4 or 5 other projects (scarfs or shawls or cowls) in progress. Not bad. I started last year with a hole lot more in the UFO piles. A couple of those UFOs met their end getting ripped off the needles. Why let them linger there if I know I’m not going to finish it for whatever reason. Off they went and the yarn returned to the stash to become something else I will love. So my final 2013 tallies — you can see images of the projects/ufos finished on my Sticks ‘n Strings page. UFOs no more: 16. Twelve of them finished and three of them taken off the needles because I knew I’d never finish them. New projects started and completed in 2013: 31! The completed projects were made up of 5 pairs of socks, 5 pairs mitts or mittens, 6 hats, 7 scarfs, 7 cowls, 13 shawl/shawlettes, and 1 baby sweater. So how did you did on your sticks and strings challenge — please leave a comment. Did you complete some of your UFOs? Make some lovely new projects over the course of the year? So next years knitting plans – check out the Knit from the Stash button for my plans for this year. I’ve gotten a couple emails about how I count the yardage used. It is not exact – I do not subtract or weigh what I have leftover from a hank of yarn. Those leftovers are generally small and they will never be used in another project so they are as good as “gone” for me (as a matter of fact they will be truly gone soon because a coworker’s daughter recently started knitting – is totally hooked, knitting nonstop – and I’m gathering all the leftover sock yarns and other yarns that I know I will never do anything with and she will be one happy gal.) So I use the “half hank” method. If I believe their is at least half a hank/ball left – I don’t count half the hank. But if it’s less than half a hank leftover, I count all the yarn as used. That’s what works for me. My first project for 2014 — Art Deco. I cast it on last night. Knitting with mohair yarn is so light and soft but it traps the heat so well so it is warm and cosy. If you click on the pattern link when you get to my project page, you can see the pattern. Oh and the yarn shown on my project page — at the last minute I changed my mind once again about what I was planning to use. The purple lightly variegated lace just was too close in color to some of the colors in the long color change yarn for the leaves. So, I ended up going back to the original yarn I purchased for the background of the shawl and changed out that purple mohair for green. I’ll have to up date the page with new photos. I also need to order another circular needle in the size I’m using. I had to put my beaded Loopy Challenge scarf on a stitch holder because it had the only needles I that size that I needed for Art Deco. 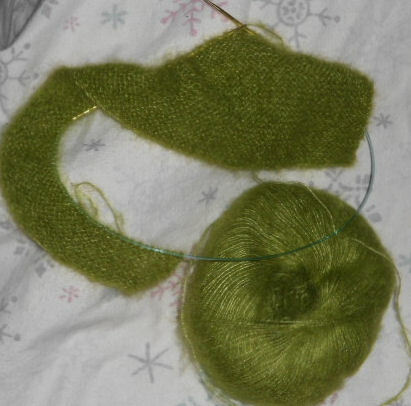 And since I want to work on both at the same time – more needles are in order. I am a big “green” fan — with the exception of mint green, I don’t know that there is a green I don’t like and this one I just adore — probably my most favorite shade of green. I’m a bit farther along than this photo I took last night but it doesn’t look like much yet – the real fun doesn’t start until the two other yarns are added in. There was one block swap held on the blog. There were 10 free quilt pattern projects presented on the blog – 9 of them between Strictly for the Birds and Stitchin with Justquiltin and one in connection with the Batik Lifesaver block swap. 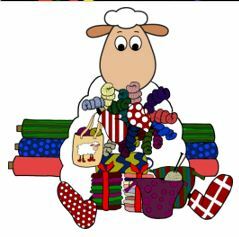 “From Head to Toe – A Knitter’s Gifts” BOM which starts in February. Several comments have been left regarding this one saying that it will be a great project to use for Christmas gifts or have on the bed by Christmas. Do not plan for that this year — this project will NOT be done by Christmas 2014. 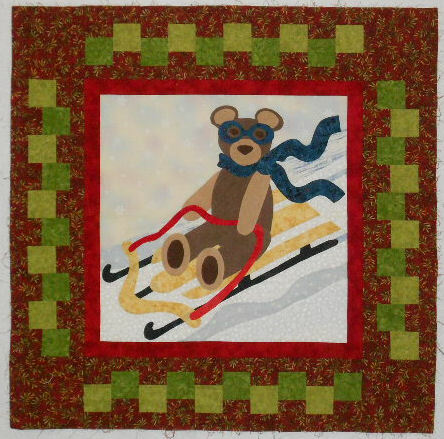 There is another mystery quilt planned for later in the year as well. Whew! I’m going to be busy! Oh — and I’ve very excited to be starting 2014 forty pounds lighter than I was October 6, 2013! Good for you with the 40 pounds! I hope I can say the same thing this time next year. You accomplished a lot! I work full-time and use that as an excuse for getting so little done. After reading your blog the past few months, I realize that is not a good excuse. Hopefully, I can follow your example and have a productive 2014. 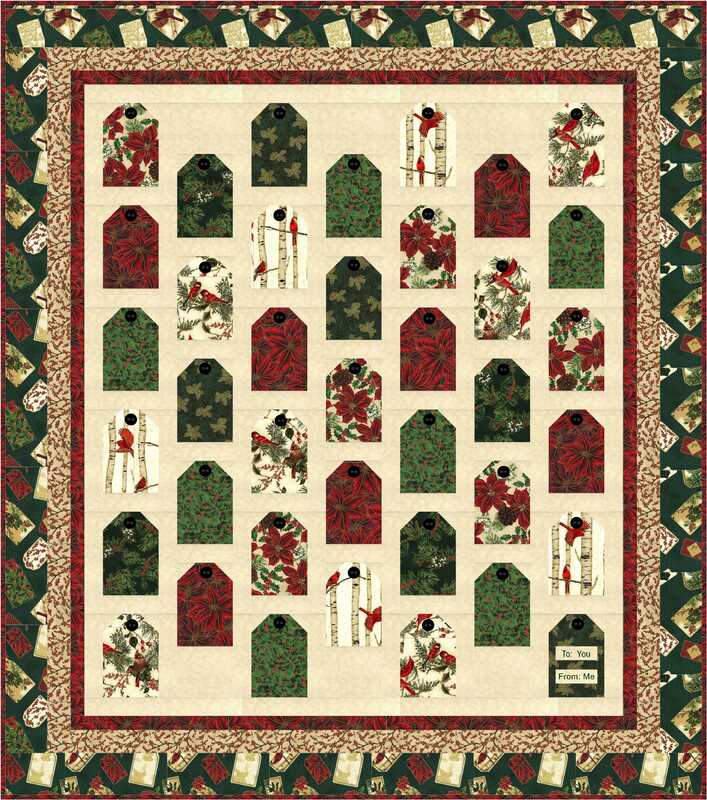 I am looking forward to 1414 Mystery Quilt Lane. Have a great 2014! Incredible! It amazes me how much you always get done. Congratulations on the weight loss as well. I think I managed 10 lbs. less than last year. I am so looking forward to starting a few new UFO’S with you this year. LOL Happy New Year’s Denise! I don’t usually plan them as UFO”S, but they usually do end up that way. Wow Denise! I am in awe of just how much you get done every year. I really need to set some goals for 2014. One will be to learn to knit socks. I am an accomplished crocheter but I think this year I need to learn to knit socks and challenge myself with some larger projects. Thanks for sharing.